Fiona Davis’s stunning debut novel pulls readers into the lush world of New York City’s glamorous Barbizon Hotel for Women, where in the 1950’s a generation of aspiring models, secretaries, and editors lived side-by-side while attempting to claw their way to fairy-tale success, and where a present-day journalist becomes consumed with uncovering a dark secret buried deep within the Barbizon’s glitzy past. I love historical fiction although it's not what you might think of as traditional historical fiction. I'm not a big fan of king/queen stories, but I do love books that take me back to an earlier time. 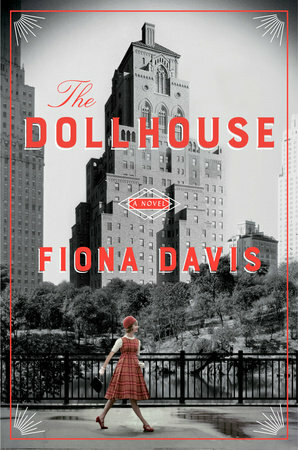 That's probably why THE DOLLHOUSE by Fiona Davis appealed to me so much! THE DOLLHOUSE is about two women who lived decades apart in the famous Barbizon Hotel for Women. Rose, a journalist who has recently moved into the building with the man of her dreams, soon finds herself in a bit of a mess. Her lover has decided to leave her to go back to his wife and daughters, and she only has a few days to move out. When she meets an elderly woman on the elevator hidden behind a hat, the journalist in her comes out. She wants to learn more about this woman and what happened in the Barbizon years ago. Darby McLaughlin arrived in 1952 to New York City to enroll in a secretarial school. She goes to the Barbizon Hotel and is assigned to live on the floor with the models; however, she knows she doesn't belong with these glamorous girls. She's a small town girl who is overwhelmed by the city and isn't exactly confident about her looks and actions. And then Esme, a maid at the Barbizon, befriends her; and Darby discovers a new world of jazz and nightclubs but also one that is a bit sleazy. As Rose investigates this woman's past, she learns that there are secrets surrounding Darby including a possible murder of her best friend Esme. Needless to say, Rose becomes obsessed with the story -- first because it's intriguing and she's a journalist at heart, but also because she welcomes the distraction from the mess that is her personal life. Rose becomes so involved in getting to the bottom of this story that her judgment becomes impaired and the ethics surrounding her research become questionable. When Rose eventually discovers the truth about the death of Esme, both women's lives are profoundly affected. I really, really liked THE DOLLHOUSE. I thought it was the perfect blend of historical fiction, mystery, and women's literature. I found the characters to be fascinating, and I thought the author did a terrific job of bringing 1950s New York, and especially the Barbizon Hotel, to life. That there was a mystery incorporated into the story was the icing on the cupcake for me! I was really impressed with how well the author told the stories of these two women. The chapters alternated between the present day story of Rose and the past story of Darby, and I loved how there were events or situations in their lives that overlapped. I was equally intrigued by both women's stories (which definitely isn't always the case in books with alternating narrators); and I found myself not wanting to put down this novel. In addition, I thought the author did a good job of bringing the 1950s New York to life especially the seedy world of the jazz nightclubs. I really enjoyed the scenes that took place there and how Esme managed to navigate that world. I also appreciated how the author showed the role of women (or maybe I should say how society viewed women) in that time period. Finally, I liked how THE DOLLHOUSE explored relationships. There was definitely some interesting relationships in Rose's life with her father being ill and her lover leaving her for his wife and daughters. And, the relationships between Darby and her mother and Darby and Esme were intriguing too. However, the book also delved into some romantic relationships for both of these characters. In fact, you might even call this novel a love story of sorts. I think THE DOLLHOUSE would make the perfect book club selection. I'm pretty sure my book club would love this book. There is a reading guide available with fifteen questions that will help get your conversation started. Some of the themes you might want to explore include friendship, independence, parent/child relationships, love, guilt, music, secrets, and how women have changed (and not changed) through the years. Overall, THE DOLLHOUSE was such a treat to read. I really enjoyed this novel and highly recommend to fans of historical fiction and mysteries. This is just the kind of historical fiction I love! I have a copy but haven't gotten to it yet. I'd better bump this up on the list! I read an excerpt of this book last week and I can't wait until I can make some time to read it. I'm glad to hear you enjoyed it. Hopefully I'll get to it soon!